It’s New Years Day. It is a time for people to start on their resolutions they made. Like millions of people around the world, I will be joining them. My resolution, like many others, is to lose weight. Not just 20 pounds, but a lot. Enough to save me from having to go the weight loss surgery route. A few months back, I had some bad test results. This worried my Doctor enough that she said “I believe this calls for immediate change in strategy.” A phone appointment later, and she was talking weight loss surgery. This was my day 1 last year. I was worried about having to get surgery done. I have previously lost weight, and gained it back. This last trip was even worse, and my body wasn’t having it. I absolutely could not live any longer being that heavy. I also need to not go back this time. Time to keep pushing forward! I stuck to my goals in general, and they worked out well for me. I didn’t get to exercise as much as I wanted, but that is on tap for 2019! Keto really helped me this last year. Just for a fact it doesn’t feel super restrictive to me, and I don’t feel as hungry all the time like I use to. I still have plenty of days where I want to eat everything in site, but it is much more manageable now. I know, very weird headline after I am praising Keto. The thing is, you can eat too much on Keto as well. It didn’t seem to matter as much at first, but I went though a couple of months trying to figure out why I just wasn’t losing weight. Keto is definitely a helpful tool for me on my Journey to get healthier. There is the appetite suppression that helps. A part of this was me actually cooking healthier foods as well. No more trip to get all the fast food. I still do from time to time, but most of it just tastes bad. Just not worth the calories. As a Type 2 diabetic, Keto has been amazing. 3 weeks into my journey last year, I had to get off of ALL my diabetes medication. It was actually lowering my blood sugar too much. My Doctor ended up wanting me to stay on some satin drugs, but in the end I stopped taking those too. I did not like how they made me feel, and my blood work was turning out great in follow up tests. You can do this. The biggest thing is just sticking with the process. Not focusing on weight loss really. Keep the focus on what you eat, and how you are feeling. Keto can be a rough thing to get started. For me, I tried to keep things simple at first. I didn’t focus as much with macros. I mainly wanted to make sure I was under 20 net carbs. I even just kept eating the same meals mostly. I did go through some Keto flu, but it was increased a bit from my diabetes medication lowering my blood sugar levels too low. I am also a tracker. I started off using MyFitnessPal, and eventually moved to Chronometer to track my food. Tracking doesn’t work well for everyone, but I think it is key when trying to lose weight. I have seen other apps to help with tracking as well, even if it is just taking pictures of your food, or using a food journal. Here is my results from January 1st 2018 to January 1st 2019. I started off at 364.8 lbs. Today I am 254.8 lbs. 110 lbs gone this year. Not only was I able to hit the 100 lbs mark, but I also got to my lowest weight in a really long time. Probably since 2000. Here is the one I have been debating forever. Do I show my progress picture. Face pictures are easy to do. The shirtless pictures, not so easy for me to post. Still, they show progress, and here they are. So now to 2019 goals. What do I want to get done this year. Well, I want to continue on this journey to get healthier, and stronger. I currently have 3 goals in mind for this year. I have others, but these are my focus. I’d love to see if I can get under 200 lbs this year. I think BMI wants me at like 165 or something weird. I feel like 185-195 is the range I really want to be in. First is to focus on getting out of the 250’s. Then Making it to 225. Running a 5k would be something I want to get done too. I am going to finish doing the C25k app, and hopefully sign up for an official race someplace. Lastly, I want to do a Pull Up. Like how awesome would it be. I never have ever done one in my life. I half cheated one when I was in middle school. To work my way to this, I need to lose more weight, and get stronger. I’ve got some workout routines to hopefully get me there. Maybe I can get it done this year. Time will tell. I have also made my latest challenge thread at NerdFitness. “Tateman: Let’s Go 2019!” Just something to help keep me accountable some what, and to share and help others along on their journeys as well. There we have it folks. 2018 was a roller coaster. I hope 2019 I will be able to reach even greater success. Good luck to everyone out there this year. Just keep sticking to it. If you fall off, just try to get yourself back up and move on! Everything seemed to be going fine, until it just wasn’t. The last couple of weeks have been rough. The mind can quickly just kind of shut everything down. The holidays in general can be rough. Fighting off all the foods, plus dealing with no money. Still, I made sure the wife and kids had gifts under the tree. I was also able to keep it keto. Oddly enough, I have been eating more, staying up later, and even stopped walking or exercising much in the last couple of weeks. Still, I lost weight. My conclusion to this, is that I may have been trying to ear too few calories again. I have hit my lowest weight again. 257.6 lbs. The last time I was this exact weight was October 10, 2014. So celebrate the victories I can haha. I am prepping for the start of the new year. Thinking of what I want to get done health wise. There are only a few days left of this year, and with all the struggles, I have made it. I stuck to my guns. I kept that New Years resolution I had at the start of 2018. Technically, I am going to start on the 31st. The new Nerdfitness challenge will begin on the 7th. My plan is to stick closer to 2,000 calories each day. I want to focus on getting 10,000 steps each day. One rest day. I also want to get in workouts and running. Monday, Wednesday, and Friday. Next year, I want to be able to do a pull up. So my workouts will help to build up to that goal. Along with my diet, I want to continue to lose more weight as well. Next step is hitting below 250. Then 225. Then possibly, I can hit that Onederland territory. Honestly, I would be happy being a pretty fit 185-200 area. Well, the weekend caught me slippin’ haha. I ended up gaining 0.7 lbs this week. Really just the last couple of days. I was down to 260.1 lbs Saturday morning. So maybe it is just extra water weight. I was just tired. I procrastinated, and then it caused me to not be able to get in my run. Still, I did get some things done around the house. At least there was some work done haha. Sunday was my Match Club Holiday party. I bowled lousy, but still had fun. 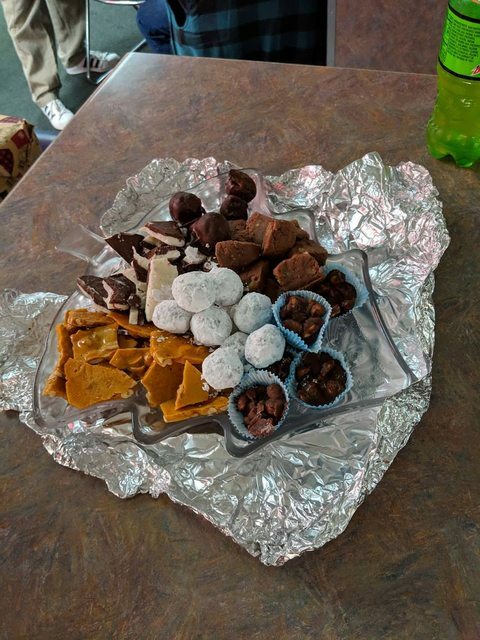 Someone brought some home made goodies for people to enjoy. All stuff I would love to jump into. I was good though, and avoided the temptation. After bowling, we hit the catering. We get Boston Market food. It end up being really good usually. This time was no exception. I ended up making myself a decent plate of food. I picked out a couple of carrot slices and broccoli from the steamed veggies. 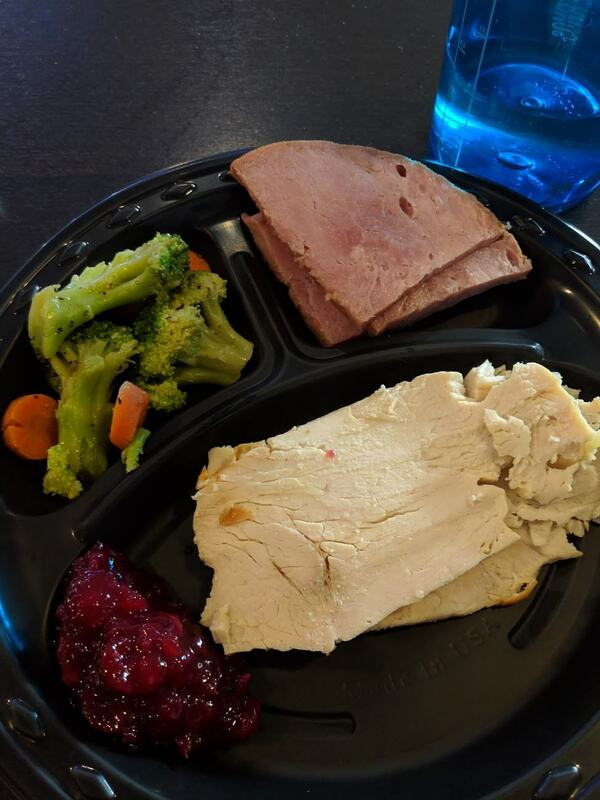 3 pieces of turkey breast, 3 pieces of ham, and a little bit of cranberry sauce. I figured I should be OK carb wise to have that little bit. I didn’t full track, just because I couldn’t find it all in chronometer, and didn’t really want to guess anyhow. 12/03 – 1586 Calories, 9 net carbs. 1613 calories remaining. 12/04 – 1699 Calories, 16 net carbs. 1129 Calories remaining. 12/05 – 1571 Calories, 12 net carbs. 1062 Calories remaining. 12/06 – 1567 Calories, 5 net carbs. 1355 Calories remaining. 12/07 – 1752 Calories, 9 net carbs. 1090 Calories remaining. 12/08 – 1568 Calories, 14 net carbs. 303 calories remaining. 12/09 – Did not track fully. 12/04 – 11:36 PM to 7:00 AM. 6 hrs 59 mins. 16 x awake for 25 mins. 12/05 – 11:24 PM to 6:32 AM. 6 hrs 39 mins. 13 x awake for 29 mins. 12/06 – 11:48 PM to 6:47 AM. 5 hrs 51 mins. 15 x awake for 1 hr 8 mins. 12/07 – 11:26 PM to 7:00 AM. 6 hrs 59 mins. 16 x awake for 35 mins. 12/08 – 11:41 PM to 8:00 AM 7 hrs 54 mins. 17 x awake for 25 mins. 12/09 – 11:30 PM to 8:24 AM. 8 hrs 1 min. 15 x awake for 53 mins. 12/10 – 11:43 PM to 6:59 AM. 6 hrs 26 mins. 15 x awake for 50 mins. I had some real rough nights of sleep this week, but also some decent ones this weekend. I did not ready the last couple of nights as well. I missed one run this week, but I did get in all my workouts. I added in some other exercises too, just to change it up some. 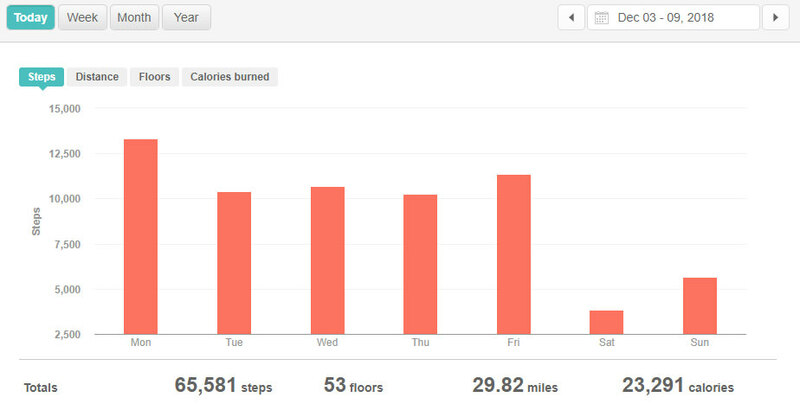 12/03 – 13,343 steps. 102 active minutes. No run scheduled. 12/04 – 10,423 steps. 77 active minutes. C25k Week 2 Day 1 finished. 12/05 – 10,682 steps. 95 active minutes. 12/06 – 10,262 steps. 65 active minutes. C25k Week 2 Day 2 finished. 12/07 – 11,379 steps. 108 active minutes. 12/08 – 3,841 steps. 0 active minutes. Run not done. 12/09 – 5,651 steps. 15 active minutes. 3 x 10 Overhead Dumbbell extensions 15 lbs each hand. 3 x 10 Dumbbell Curls 15 lbs each arm. I need to try to kick this back up to 11! I did get my workout in today. So now I need to get back to running tomorrow. Well, last night was a little better sleep. 11:26 PM to 7:00 AM. 6 hrs 59 mins. 16 x awake for 35 mins. I still woke up a few times. I’m not sure if it is all me, or me reacting to my wife getting up as well. Apparently neither one of use are getting the best sleep these last couple of days. Still, today was better overall. I wasn’t as tired out. I got in my steps for the day already. I also got in my workout today. Just did my normal workout. It wasn’t easy, but I got in my run on the 6th. I have to get some food made. All of my convenience food is gone 😉 I will have the Bowling Holiday match club meetup on my rest day. Still yet to decide how I shall handle the food. Last night, was one of the worst sleeps I have had. 11:48 PM to 6:47 AM. 5 hrs 51 mins. 15 x awake for 1 hr 8 mins. It felt like I woke up much more then that. It took awhile to get to sleep, then I was up before one, then up again at two something. Then 4 something. 5:30, and eventually I just got up at 6:30. The dog was pacing and wanting to go out for whatever reasons too. My wife was handling that. With sleep being this bad, it very much effected my attitude and ability to want to do anything today. This morning, I dropped my son off at school. I then went to the park I run at. It took me a bit, but I talked myself into doing it. Every run was a trial. Each run “Just quit” “Too tired”. I pushed on though. I finished it. I hoped it was enough to push me through the rest of the day. I suppose it was enough. I am super tired still. I bowled alright, but was really too tired for that. Ended up struggling. I pushed off a lot of my stuff today, but am squeezing it all in here at the end. Pretty short post, but I wanted to get it in. I hope tonight, I can get some rest! Today was workout day. I decided to change it up a bit. I figured I have been doing so much with my legs, (running and walking, plus squats on workout days) that I should switch it up. So I did a some push pull type exercises with some dumbbells. Tomorrow is run day again. Everything seemed to go well yesterday. Started up Week 2 of the C25k app. My lungs were on fire the last 3 running intervals, but it was all good. It just makes me worry about if I will be ready for the next week after this. I have faith in the training! 10,423 steps. 77 active minutes. C25k Rundouble Week 2 Day 1 completed. We got running to get in tomorrow, plus the usual 10,000 step goal. It will also be bowling later. At some point, I need to get to storage and get out some Christmas stuff too. Busy times!